This hang tag comes from alternative sports company Element. It is a decently heavy card stock and makes use of the yellow text over navy blue color motif used by, most notably, Ralph Lauren. The front has two different fonts, a bold sans serif block and a slightly more flowery serif, that also used small caps. The text leaves out the product name in favor of the name of the “collection.” I’m going to guess that this is Wolfeboro, New Hampshire, but I imagine the name sounded right more than anything else. The two tags lines, “Made to Endure the Elements” and “Inspired by Simple Living” tell you all you need to know. This is lumberjack wear. Or, more specifically, I am living in a cabin on a mountain and snowboarding every day wear. The idealized cabin is right there, in case you needed a hint. “Inspired by Simple Living” is fine, especially since it is self-limiting, its only inspired, it is not actually representative. 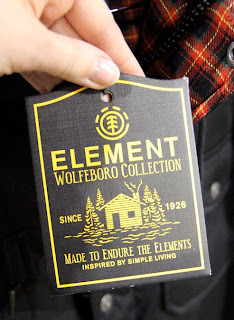 I have a bit of a problem with the other tag line though: “Made to Endure the Elements.” It uses the company name in the tag line, and in a negative way. If the elements are something that one must endure, what does it say about element clothing? Clothing made to endure our clothing? Sloppy work. I have, however, always been a huge fan of the Element logo. The stylized pine tree shows well here, especially with the other pieces of this tag. One of my favorite logos in apparel, and it comes from a company founded on irreverent skateboard designs.